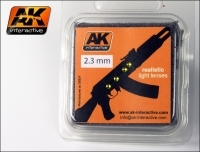 AK 211 Realistic Lens Amber 2.3mm DiaAK-211 New accessories for all types of sights, lights, optics etc. on any vehicle. The most realistic and easy to use solution for our models. Just take the selected lens with some tweezers and stick it to your vehicle with loctite. Forget the complicated job of painting the lights on your Lorries and cars. A professional alternative with a super realistic finish.